Ever since we humans knew religion, the ‘Aadi Shakti’, the goddess represented purity, fertility and prosperity. Mythology and religious sentiments have always found association in Goddess statues. Most of the religions including the so-called Pagan cults have adorned the sacred feminine and this found vent in some of the most breath-takingly sculpted goddess statues. They are considered luck charms. 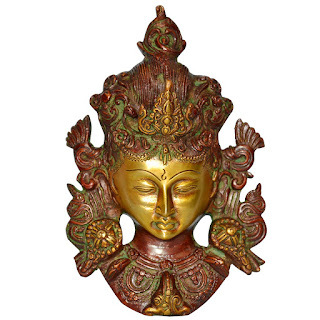 Our collection of Goddess statues are intricately carved representations of the sacred feminine spirit. Brass, a perfect union of copper and zinc, is used since 500 BC. Our exquisite collection of brass statues captures the eternal, ethereal beauty of brass in timeless pieces of art. An art form that can enhance the ornate allure of interiors be it home, office or just about any place. No tastefully done interior is complete without a brass statue or sculpture. Connoisseurs place brass artwork in all together a different bracket, defined by no other art form. These religious statues are perfect imitation of our artisans skill.